It is truly hard to believe that yet another annual ASIS International Seminar & Exhibits has just concluded. Dallas provided a convenient location to see, learn, and network. While my corporate security and vendor colleagues and I get a tad older each year, it was great to see the younger generation learning and working that exhibit floor. I recall the days when the exhibits occupied a small room. Two or three companies produced the electronic security devices we knew and loved. Getting to all the exhibits was more than possible during our week at ASIS each year. As the number of companies and exhibit floor space grew, Roy Bordes, CPP helped us sort out which companies and technologies were worthy of our limited ASIS exhibit floor time. Roy is sorely missed by those of us that knew him. While PRS has not been paid a fee, and does not specifically endorse any of the products discussed, we thought it would be fun to put forth our list of top security tech for 2017. It is not a detailed technology review and as with all technology, you really need to assess your needs case for applicability. These former law enforcement officers have taken a technology that has been around for some time and has often presented challenges and have tamed the beast to a degree. It really depends on the application, but Blue Line’s product deployment can be intimidating for an illegitimate user of a space. While the system can tackle one-to-many scans, we all know that the size of such databases makes a search slow as a snail. Blue Line’s true processing power shines with a dedicated door or portal application. The system integrated with a number of existing products. A camera and credential reader greets the user. A fraudster with invalid credentials will not want to come here. I can see this very effective for a convenience store, high-end jewelry store and related retail. Of course, no credential is presented in this scenario, but a thug with a hoodie or face mask is not going to gain entry. In corporate environments, vulnerable IT rooms, C Suite offices, and other sensitive areas would be served well by Blue Line Technology. 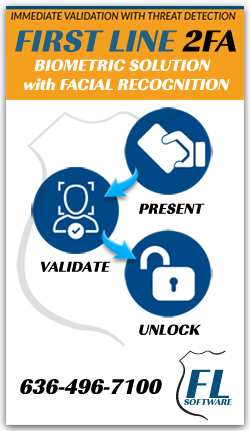 Two-factor authentication that moved the security beyond a card. Too many good features to list here. They plug and play with a wide variety of existing security systems.